I know, I know, it’s not even Halloween yet and I’m dropping the C-bomb all over the place BUT if you’re calendar is anything like mine, you’ll be getting booked up quickly and I have some VERY important dates to share with you. So, grab your diary and start getting excited about Christmas shopping because I’m about to tell you about some mighty lovely. festive events I’ll be taking my little stall of Sunshine too this year! YAY! Norwich Makers Market is back at St Thomas's for their annual Christmas Market showcasing the designers, makers, illustrators, artists, ceramicists, printmakers and much much more! Deerly Beloved will be running the cafe and providing sumptuous cakes and savouries and there will be goodie bags for the first 20 through the door to kick off the festivities! Hope to see you there! FIND OUT MORE & JOIN THE EVENT ON FACEBOOK HERE. Cambridge Made return to St Andrews Street baptist church for the fourth year of our popular Christmas Fair, an Etsy Made Local event. At least 45 designer-makers from Cambridge and East Anglia will be joining us across the three days - including Cambridge Made favourites and a host of exciting new makers. We've hand-picked our selection to represent the best of the area, with the aim of creating a one-stop destination for your Christmas gift shopping! What will you find? • Handmade jewellery to suit all tastes. • Knitted, crochet and textile accessories. • Stunning original Christmas cards and decorations. • Individual ceramics and glassware. • Gifts for bike lovers and book lovers. • Beautiful wood products worked by hand. • Original prints and artwork by our favourite artists. • Organic handmade bath and body products and gift sets. • Quirky and unusual items you won't spot anywhere else. Join us for some genuine seasonal magic, browse the stalls, chat with our friendly makers and then have a sit down with a hot drink and a sneaky mince pie or pastry in the adjoining cafe. We always pull out all the stops to make our Christmas Fair the loveliest event we can, but this year we've found a few extra stops down the back of the sofa and pulled them out too! Keep an eye on this page as we bring you gift guides and news of our makers over the coming weeks. We're looking forward to meeting you! Brighton’s iconic Dome is once again host to the Brighton Etsy Seller’s Team’s annual Christmas market, which is back for the 5th consecutive year with over 70 local designers, makers and artists selling their work this December. The carefully curated market will feature the most unique, high quality gifts to get you Christmas-ready. 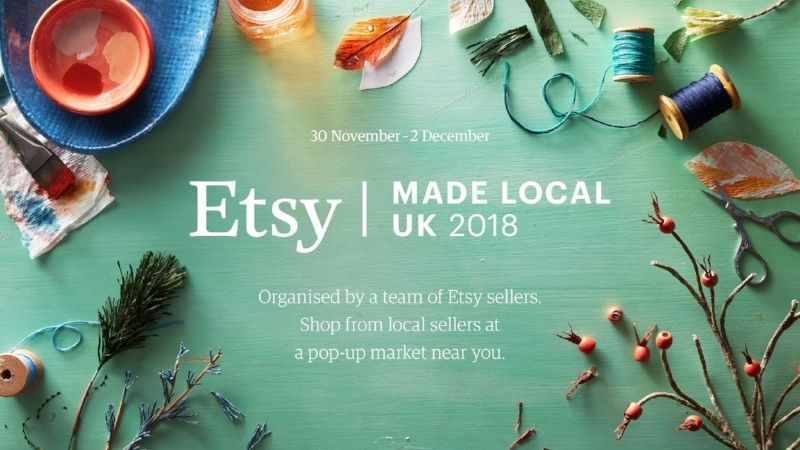 We are excited to be collaborating with Etsy again and holding Etsy Made Local 2018 at The Assembly House! With over 30 super talented designers, makers, illustrators and printmakers it's going to be the perfect place to pick up your pressies! As well as being lucky enough to be at these FIVE fabulous events, you’ll also be ale to find a bit of Sunshine at these wonderful new Pop-Up shops this Christmas! A long time, favourite Sunshine stockist, Rhea at Handmade Nottingham has just opened an AMAZING, super-sized pop up shop right in the heart of Nottingham City Centre! FIND OUT MORE OVER ON THEIR FACEBOOK PAGE HERE. A festive pop-up shop featuring homewares, jewellery, cards, wrap, gifts, kidswear, ceramics + more from a selection of hand-picked local makers. Phew! That’s a whole lot of Christmas Shopping info and inspo right there! I hope you can make some of the events and I get to see your lovely faces over the festive season! If you can’t make it to any of these then FEAR NOT, you can always take a peek at the STOCKIST page over on hello-sunshine.co.uk to see if you’re local to anywhere selling Sunshine. That’s enough festive frolicking for now… I’ll be back soon with a peek at some of my faves from this years Christmas Sunshine selection!